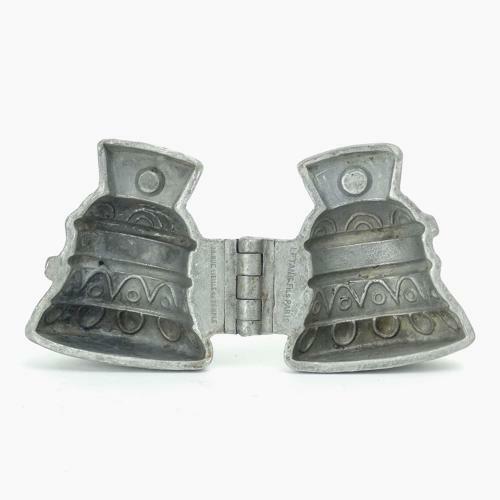 A small pewter ice cream mould in the shape of a bell. This mould is stamped, on the inside of the hinges, 'LETANG FILS PARIS 108 RUE VIELLE DU TEMPLE'. It is also marked, in the casting on the outside of the mould, with the company mark 'L.G.' and the pattern number '1893'. It dates from c.1880. It is very well detailed, with an attractive design on the bell, and it is in good condition. The exterior has quite a pale patina and the interior is slightly dull but it could still be used. Price includes postage with the U.K. Shipping to the U.S.A. add £10. Western Europe add £5.